The following are speeds that affect the jet airplane’s takeoff performance. 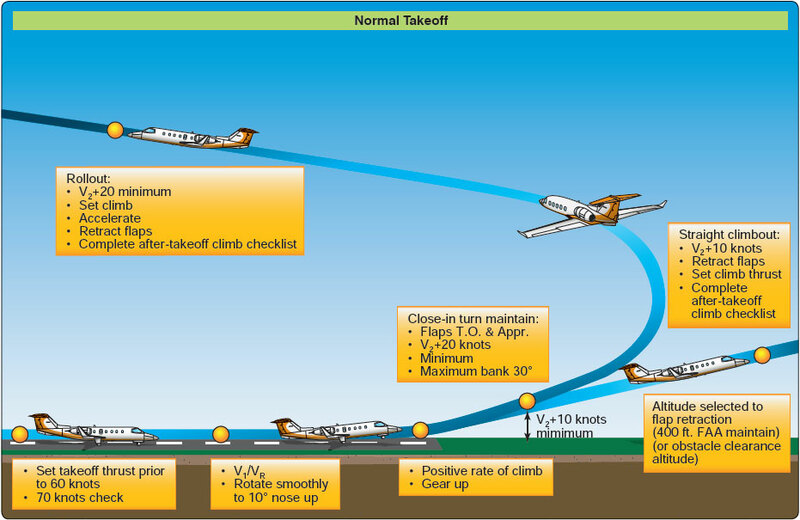 The jet airplane pilot must be thoroughly familiar with each of these speeds and how they are used in the planning of the takeoff. VS—stalling speed or minimum steady flight speed at which the airplane is controllable. V1—critical engine failure speed or takeoff decision speed. It is the speed at which the pilot is to continue the takeoff in the event of an engine failure or other serious emergency. At speeds less than V1, it is considered safer to stop the aircraft within the accelerate-stop distance. It is also the minimum speed in the takeoff, following a failure of the critical engine at VEF, at which the pilot can continue the takeoff and achieve the required height above the takeoff surface within the takeoff distance. VEF —speed at which the critical engine is assumed to fail during takeoff. This speed is used during aircraft certification. VR—rotation speed, or speed at which the rotation of the airplane is initiated to takeoff attitude. This speed cannot be less than V1 or less than 1.05 × VMCA (minimum control speed in the air). On a single-engine takeoff, it must also allow for the acceleration to V2 at the 35-foot height at the end of the runway. VLOF—lift-off speed, or speed at which the airplane first becomes airborne. This is an engineering term used when the airplane is certificated and must meet certain requirements. If it is not listed in the AFM, it is within requirements and does not have to be taken into consideration by the pilot. V2—takeoff safety speed means a referenced airspeed obtained after lift-off at which the required one-engine-inoperative climb performance can be achieved. Takeoff data, including V1/VR and V2 speeds, takeoff power settings, and required field length should be computed prior to each takeoff and recorded on a takeoff data card. This data is based on airplane weight, runway length available, runway gradient, field temperature, field barometric pressure, wind, icing conditions, and runway condition. Both pilots should separately compute the takeoff data and cross-check in the cockpit with the takeoff data card. Figure 15-20. Sample captain’s briefing. The entire runway length should be available for takeoff, especially if the pre-calculated takeoff performance shows the airplane to be limited by runway length or obstacles. After taxing into position at the end of the runway, the airplane should be aligned in the center of the runway allowing equal distance on either side. The brakes should be held while the thrust levers are brought to a power setting specified in the AFM and the engines allowed to stabilize. The engine instruments should be checked for proper operation before the brakes are released or the power increased further. This procedure assures symmetrical thrust during the takeoff roll and aids in prevention of overshooting the desired takeoff thrust setting. The brakes should then be released and, during the start of the takeoff roll, the thrust levers smoothly advanced to the pre-computed takeoff power setting. All final takeoff thrust adjustments should be made prior to reaching 60 knots. The final engine power adjustments are normally made by the pilot not flying. Once the thrust levers are set for takeoff power, they should not be readjusted after 60 knots. Retarding a thrust lever would only be necessary in case an engine exceeds any limitation, such as ITT, fan, or turbine rpm. If sufficient runway length is available, a “rolling” takeoff may be made without stopping at the end of the runway. Using this procedure, as the airplane rolls onto the runway, the thrust levers should be smoothly advanced to the recommended intermediate power setting and the engines allowed to stabilize, and then proceed as in the static takeoff outlined above. Rolling takeoffs can also be made from the end of the runway by advancing the thrust levers from idle as the brakes are released. During the takeoff roll, the pilot flying should concentrate on directional control of the airplane. This is made somewhat easier because there is no torque produced yawing in a jet as there is in a propeller-driven airplane. The airplane must be maintained exactly on centerline with the wings level. 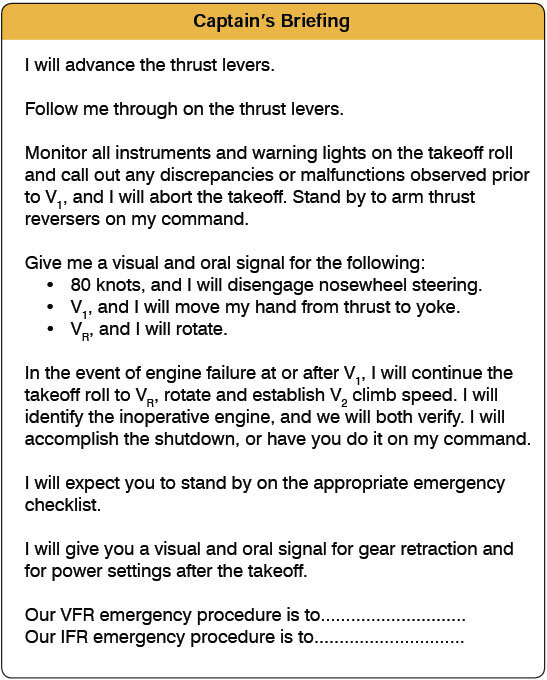 This automatically aids the pilot when contending with an engine failure. If a crosswind exists, the wings should be kept level by displacing the control wheel into the crosswind. During the takeoff roll, the primary responsibility of the pilot not flying is to closely monitor the aircraft systems and to call out the proper V speeds as directed in the captain’s briefing. Slight forward pressure should be held on the control column to keep the nose wheel rolling firmly on the runway. If nose-wheel steering is being utilized, the pilot flying should monitor the nose-wheel steering to about 80 knots (or VMCG for the particular airplane) while the pilot not flying applies the forward pressure. After reaching VMCG, the pilot flying should bring his or her left hand up to the control wheel. The pilot’s other hand should be on the thrust levers until at least V1 speed is attained. Although the pilot not flying maintains a check on the engine instruments throughout the takeoff roll, the pilot flying (pilot in command) makes the decision to continue or reject a takeoff for any reason. A decision to reject a takeoff requires immediate retarding of thrust levers. The pilot not flying should call out V1. After passing V1 speed on the takeoff roll, it is no longer mandatory for the pilot flying to keep a hand on the thrust levers. The point for abort has passed, and both hands may be placed on the control wheel. As the airspeed approaches VR, the control column should be moved to a neutral position. As the pre-computed VR speed is attained, the pilot not flying should make the appropriate callout, and the pilot flying should smoothly rotate the airplane to the appropriate takeoff pitch attitude.